Hello! It’s time once again for a BDJ Box post. If you’re not familiar with it, it’s a subscription service in the Philippines. This month, they sent out limited edition “BDJ Box Elite” boxes, which I am verver excited about. This box contains a lot of full-size products, as well as generous samples. None of that sachet nonsense! (JK I am mean, but really, small tubes rock.) 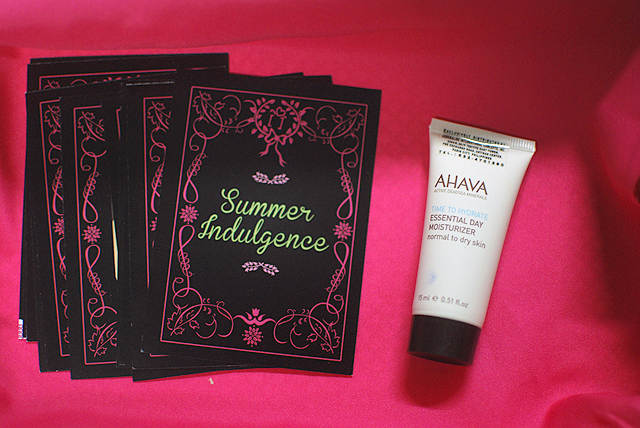 The theme is “Summer Indulgence,” and for once I do think it fits the products inside. The nifty thing about these new cards is that they show you the original size and price, and the sample size they give and the calculated cost. That way, I don’t have to do any math! Ever since I figured out that I had dry skin (patches all over, yeesh! ), I’ve been obsessed with facial moisturizers, so this is an A+ for me. I also typically like Ahava products, so I’m excited to try this out. Davines Nounou Shampoo — Using high-grade natural ingredients, this shampoo is supposed to nourish, moisturize, and protect your hair. It’s perfect for colored hair, too, since it’s sodium chloride-free, which is supposed to make color last. Full size: 250ml, Php 1020. Sample size: 75ml, Php 390. 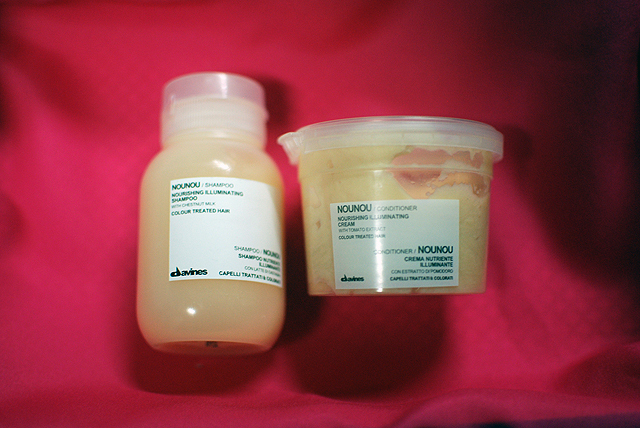 Davines Nounou Conditioner — The sweet almond butter acts as a hair emollient, and the tomato extract protects hair from free radicals. It’s a maintenance conditioner that’s supposed to highlight the “luminosity” and “fullness of tone” of your original hair color. Full size: 250ml, Php 1085. Sample size: 75ml, Php 390. I’m very low maintenance when it comes to hair, but I am curious about these products enough to want to try them. My sister loves tinkering with her hair, so the rest of it will probably go to her. 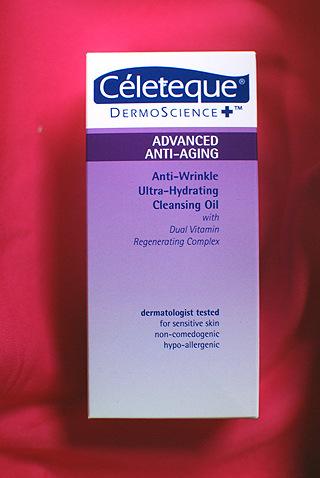 Céleteque Dermoscience Advanced Anti-Aging Anti-Wrinkle Ultra-Hydrating Cleansing Oil — Aside from being a mouthful, this sounds like a promising product! It supposedly has a “Dual Vitamin Regenerating Complex,” and is made using DermoScience technology with derma-grade ingredients for overall skin health. These kinds of promises normally scare me, lol, but I am willing to give this a shot. I love cleansing oils, and this one is interesting since you don’t use it the usual way you use COs. I also like that it promises long-term effects such as healthy tissue regeneration, increased skin elasticity and moisture levels, firmer skin, and reduced fine lines, wrinkles and pigmentation. You know, instead of just cleaning off your makeup. Full size: 100ml, Php 599… or Php 369. Who really knows? 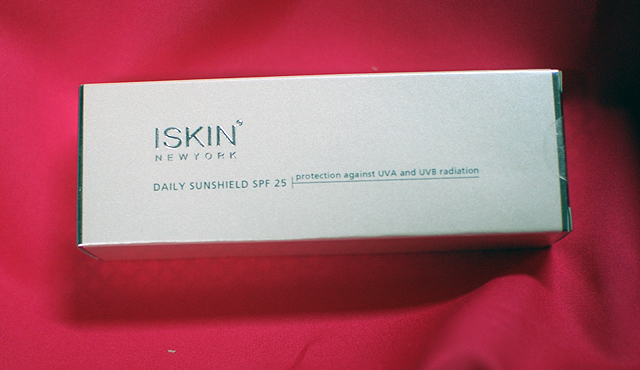 ISkin New York Daily Sunshield SPF 25 — Though ISkin New York is a US-based company, they formulate their products for Asian men and women. It’s basically a facial suncsreen, which I always like. Although the expiration date for this tube is pretty close to today (July 2013), so IDK if I should use this first instead of my current facial sunscreens. I feel like it’s a bit expensive for something that other cheaper products can give. Full size: 57ml or 57g, Php 2900. Revlon ColorStay Ultimate Suede in Iconic — A long-lasting, lightweight lipstick, supposedly. I tried it on, and I actually like the color, though this comes with the kind of glitter that makes lipstick look metallic but it’s not crazy-looking on the lips. It’s supposed to moisturize the lips with shea butter and aloe, but I don’t feel like it moisturized my lips particularly. I do like the color, though, so yay. SureSlim Wellness Centre Gift Voucher — Is this a sign? I hope not. If you plan on joining their Weightloss Program, the voucher gives you Php 1500 until April 30, 2014. Juicy Couture Viva La Juicy La Fleur — I don’t know about you, but as a person who doesn’t normally go out and buy perfume, I do appreciate perfume samples, especially when they smell nice and look as pretty as this. This one is fresh (for summer! ), and mixes berry scents with citrus and floral scents. It’s not something I’m a huge fan of, but the bottle makes it OK. Is that shallow? I dun curr. The info card is also a coupon for a GWP when you buy a Juicy Couture fragrance at Rustan’s Makati until June 1st. Full size: 150ml, Php 5600. Sample size: 5ml, Php 450. 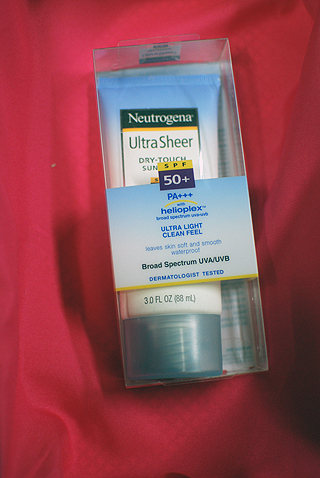 Neutrogena Ultra-Sheer Dry-Touch Sunblock SPF 50 — UM AWESOME? I hate heavy sunscreen, and the one I use now (Hawaiian Tropic) is great, but this has a higher SPF, so I really want to try it. I’ll use up my current sunblock now, though, because these have a tendency to go bad. Which isn’t really a problem because you should wear sunscreen everyday anyway. I think the usual yucky texture of sunscreen is the deterrent that keeps people from wanting to wear it everyday. But, it’s important, so I’m glad that companies have been trying to improve their sunblock formulas. My friend Barby uses this sunscreen and I think my sister does also. This can also be used for the face and body, so you don’t have to buy two separate sunscreens. It’s pretty accessible, too, so that’s always good. Full size: 88ml, Php 509.25. All in all, a good box from BDJ! I’m not sure if they sell these boxes because I can’t find info on my cards or online, but Tina said that a monthly subscription is priced at Php 1950, and she has more info on the BDJ Box Elite in her post. The regular BDJ box is Php 580 (raised from Php 480). You can purchase your own BDJ Box subscription, in varying increments of delivery frequency, here. * I was sent this box by the BDJ Box Team, all opinions are my own. I have not been compensated or required to write this review, in exchange for the box. This box includes items from companies that test on animals. Read about my personal cruelty-free pledge here. 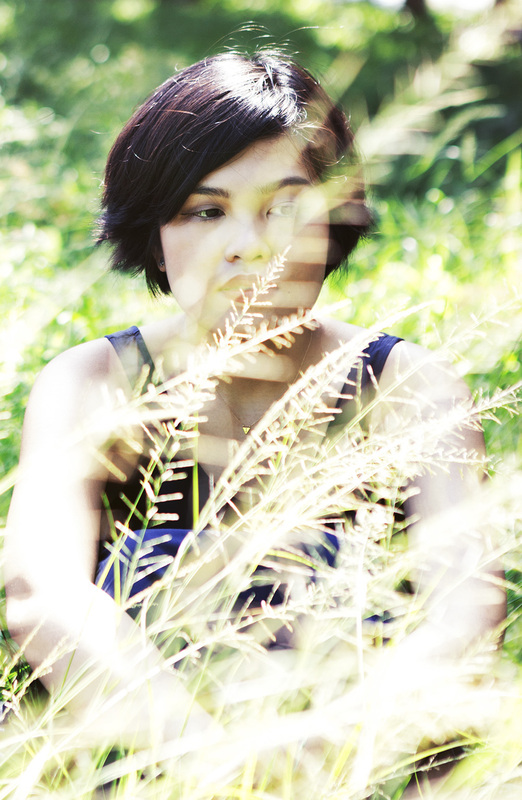 Is the Céleteque thing really effective? Wow! This box is pretty awesome. I heard good things about Davines! Wow, I didn’t notice the regular monthly fee increased. Not that I really begrudge them that, as BDJ makes really good subscription boxes. BTW the Celeteque cleansing oil comes in two sizes. The big one is 369php and the small one is 199php. I think they’re one of the better ones currently, too! I think the increase just started this month. I loved this box. I can’t wait for when you get to the Neutrogena sunblock. It’s amazeballs!!! I can wear sleeves and sunblock for the first time! The one I’m using now is pretty great too, but I have to use at up lol. Can’t wait! You didn’t like La Fleur?! Then again perfumes smell different on different people. I got a sample in birchbox and ended up buying the full size version not too long ago. The full size version is super cute with little charms on it. There was something off about it for me. Glad you liked it though. I do love the little bottle!